If are reading this, then you are quite likely a user of (or at least know about) our suite of developer tools. It is the foundation of Teamstudio and many of them have been available for over 20 years. Our tools are used by literally thousands of people every day. In fact, IBM uses our developer tools for the creation of many of the Notes templates that you currently are using. If you are a user of our developer tools then you already know the power of what they can provide (e.g. reporting on the differences between two Notes databases, analyzing the design of a Notes database within your Notes client, performing a search & replace within your code, etc.). But have your ever run into a situation where you wished you could run the tools in a background thread? Or maybe you need to process multiple Notes databases with the same options in the tool? Or you might even need to run a design audit on all of the Notes databases on a Domino server? If you've ever run into any of the above situations (or any others similar) you might find the process to be a bit cumbersome, since the tools run in the foreground on the single Notes database that you selected. If you had to perform a design audit on hundreds or even thousands of Notes databases, it would take a very long time and would require your input for each Notes database being processed. So how can you streamline these processes? This is where the developer tools' APIs can help. We actually use the APIs within one of our own applications, Build Manager, to trigger background processes that can perform design audits, search & replace of design and/or documents, and even perform a design difference check between two similar Notes database designs. If you use any of these products and have experienced a time when you needed to use the product on multiple Notes databases at the same time, then this blog post is for you! The following information will get you on the track to creating some awesome companion utilities that will work with the developer tools that you already own. With every installation of our developer tools you also receive a series of LotusScript libraries which contain the APIs that you can use. The most common method for using the APIs is to copy the required LotusScript libraries into your own application. All of the required LotusScript libraries for the Analyzer, Configurator, Delta and Validator APIs can be found in the Teamstudio Reports template (tmslogs.ntf). The API for CIAO! can be found in the CIAO! Configuration template (ciao.ntf). These templates were deployed into your local IBM Notes data directory during the installation of the developer tools. As you can see, we attempt to make it as easy as possible to understand what to use. In the case of the CIAO! API there are a number of other script libraries within that template, but they are for the other actions that occur within the CIAO! configuration database. For the remainder of this article I will be focusing on the Analyzer API. The other APIs are similar in their implementation, but since Analyzer is one of our most popular applications I will focus on using its API. For the integration I created a new Notes database and copied the Analyzer script library from the above-mentioned template. 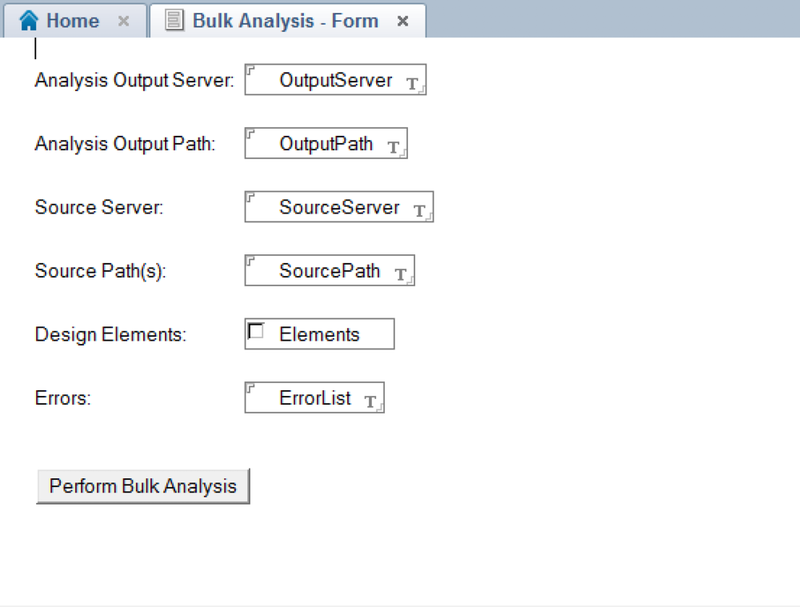 Now I can start building the functionality that I need to run Analyzer in a "bulk process". Now that we have the fields we need, we can start with the code. Before we can save the form we will need to make sure that the "ErrorList" field has a formula as it is a computed field. For this, we want it to compute to itself. This is most easily done by using the @Formula "@ThisValue". I use this @Formula in case I want to change the field name in the future; I won't need to remember to change the @Formula with this code. The only other field that we need to supply some information for is the "Elements" field. With this field I want to list all of the design elements that can be analyzed. The Analyzer API understands a set of "Context Filters" which provide a list of all the design elements that Analyzer can run against. The list and more information about the Context Filters can be found in our documentation here. If your plan is to always analyze ALL design elements then you will not need this field as we can pass an empty string into the API to indicate that we want to analyze everything in the Notes database. For my needs I will be using the "DEANAnalyze2W32" and "DEANStringLoadW32" API calls as I want to be able to analyze selected design elements and I also want to report on any errors. For the purposes of this article I am going to code everything within a single button on the form. For a more robust, reusable solution I would recommend using a new LotusScript library. Now that we have a handle on the values that you will be entering into the form we need to make sure that the fields have the required values. There's no need to allow them to run the API call if it will inevitably fail. For this we will be making sure that all of the editable fields have a value. If you want to add more validation (such as server availability, path structure, output database existence, etc.) this is where you would add that type of validation. For now, I'm going to assume that you will be entering the values correctly! If note.GetFirstItem("OutputServer").Text="" Then msg=Chr(10)+Chr(9)+"Analysis Output Server"
If note.GetFirstItem("OutputPath").Text="" Then msg=msg+Chr(10)+Chr(9)+"Analysis Output Path"
If note.GetFirstItem("SourceServer").Text="" Then msg=msg+Chr(10)+Chr(9)+Source Server"
If note.GetFirstItem("SourcePath").Text="" Then	msg=msg+Chr(10)+Chr(9)+"Source Path"
If note.GetFirstItem("Elements").Text="" Then msg=msg+Chr(10)+Chr(9)+Design Elements (select at least one)"
As you can see we are presenting a list of all fields that do not meet the basic validation requirements and presenting that list once. We could just as easily have created an @Formula and used it in the field's input validation, but I think it is better to present the user with a full list of the problems, instead of one at a time, which is what happens when using the input validation formula. So now we have a handle on the values that the user enters, we've created validation code and now we can start using the API call (finally!). For this part I need to set up a series of variables to hold the values that were entered on the form, some additional variables to access the databases being analyzed, and also to setup return values from the Analyzer API calls. Before we start using the Analyzer API calls (they're coming up next!) we also need to add some code to make sure that the databases that were entered into the "Source Paths" field actually exist and that the user has the rights to access them. This code is also very straightforward. One note about this code; if you are a seasoned LotusScript coder, you are going to notice a "Bad Coding Practice" in this section, namely the use of "Resume Next". Yes, I know that this should rarely if ever be used, but for this example I do use it to trap any kind of problems that might occur when the code attempts to access the source database. Sometimes it just needs to be used. errors=errors+Chr(10)+"DB: "+paths(x)+", ERROR: Cannot access database"
We will also be passing into the call two flags. The flags are what control how the Analyzer application will interact with the user. In our case we want it to run silently and also create the Analyzer output database if it does not already exist. A full list of the flags that can be used can be found on our documentation site here. As you can see the API call is the least amount of code that we have created so far. The rest of the code is really a lead up to the API call. Of course, there are lots of ways to make this more functional and easier for the end user to use, like adding a server and database picker (so the user doesn't enter the information incorrectly), using an agent that runs the "Bulk Analyses" code in a background process (so your Notes client is not held hostage by the process), a more styled interface so it doesn't look like a Notes 3 form, etc. Those improvements I leave up to you. Older PostCentralized vs Distributed Version Control Systems - What's Best for Notes Development?